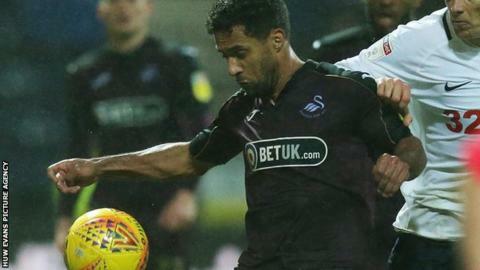 Manager Graham Potter says veteran winger Wayne Routledge could be offered the chance to stay at Swansea City. Routledge, 34, sees his Liberty Stadium contract expire this summer. But Potter, who seems in positive mood after meeting new chairman Trevor Birch, says Routledge could be given a fresh deal. "We'll keep the discussions private but we're certainly open-minded to having him here. As a player and person he's great to have around," Potter said. "On and off the pitch Wayne's showing he can contribute and help." Routledge, who has made 252 appearances since arriving from Newcastle in 2011, is the senior figure in the Swansea dressing room. He was close to leaving at one stage last summer and then looked to have little future under Potter after going more than two months without playing in the autumn. But since being recalled in December, Routledge has proved he can still be an influential figure. "He's been really important for the whole season," Potter added. "Even when he wasn't playing, which was probably a consequence of a messy summer window, he conducted himself in a professional manner. "Then he gets the opportunity to play and you see his quality. He can play on either side and through the middle and he brings experience and calmness." While the immediate focus is on this season - and on Saturday's Championship clash with Middlesbrough - Potter is looking further ahead having had discussions with Birch, who has officially started in his new role. "We've been speaking on the phone and I've met him over the last couple of weeks - we had dinner," Potter said. "He's optimistic and positive and I'm looking forward to working with him. He brings an experience and an understanding of football which will be really useful for us. "We'll have further conversations as we go but it'll be great to get his input, his support and direction." Swansea are 10 points adrift of the Championship play-off places with eight games to play. Five of those fixtures are at home - where the Swans have lost once in nine - while the three away trips are to clubs in the bottom half of the table. When asked about his team's top-six chances, Potter said: "You have got to get a lot of points to get in there but, while it is mathematically possible, everybody should think it is possible."